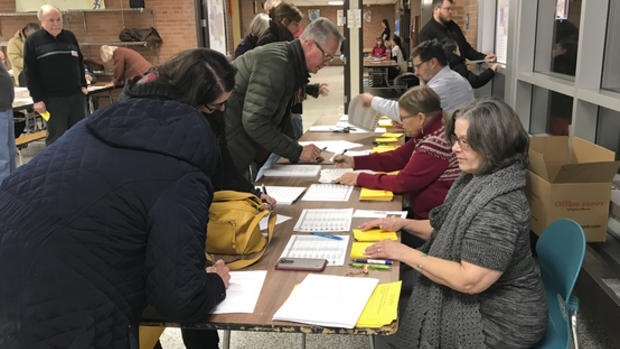 Volunteers help community members register at the DFL caucus in Senate District 54. Walking into the Hastings High School, I was immediately greeted by hordes of folks red, white, and blue, Angie Craig t-shirts. After accepting stickers from various volunteers, I finally made it to the check in table where I was checked in by none other than former Cannon Falls English teacher, Roz Hjermstad. She gave me a name tag and a stack of papers, on top of which was the schedule. Once I had all the information I needed, I proceeded into the gymnasium to participate in my first ever DFL county caucus. The convention began with two speakers, Angie Craig, and Jeff Erdmann, both of whom are running for Congress. Each speaker got two minutes to tell the group why they’re running and why they believe they are qualified to replace Jason Lewis. The entire caucus seemed bound and determined to get more Democrats into office this election season, and it seemed as though Angie Craig was a crowd favorite. After listening to these speakers, we turned in our party platform ballots and broke off for lunch. Once everyone was seated again, it was time for the walking subcaucus. A plethora of people flooded down to the floor with homemade signs saying everything from, “Education and Angie Craig,” to “We support DACA!” Each of these people had one goal, create their own subcaucus with enough people to send a delegate to the state convention. Each person was awarded one minute to speak about their cause, but one really stuck out to me. Besides me and my liberal partner in crime, Rosemary Reardon, there was one other young person and she was starting a subcaucus dedicated to education and Angie Craig. Both Rose and I decided to join her in her endeavor to get to the state convention. After a chaotic period of time had passed, the walking sub caucus was over and our little group gained enough people to send one delegate and one alternate to the state convention. After some debate, we landed one young person, and one older person. As everyone began to return to their seats, I took another look around. This time, it stuck out to me how much younger I was than everyone else in the room. This seemed wrong to me as I have heard most of my classmates express their political preferences, but it seems young people aren’t willing to get out there and make it happen. CFHS senior Grant Schlichting decided to take the plunge and find out what caucuses are all about. There were a few familiar faces when I entered the room. Two of my friend’s moms were there, and a couple that attend the American Legion meetings that I knew from Boys’ State. Other than that, the median age in the room was fifty. I and another eighteen year old seemed to be the only ones under the age of thirty. It was worrying to me – there isn’t a lack of interest in politics in our generation – everyone has an opinion on an issue and wants to express it – it’s a lack of efficacy. People in general don’t put their principles to practice, so that’s what I decided to do on Friday March 2nd at the Republican Senate District 58 Convention. ` The convention started with speeches from those who are running for the Republican Nomination for Governor. Former Nominee Jeff Johnson started off the three minute Speeches, with Mayor of Woodbury Mary Giuliani Stephens second. Intelligence Officer Phillip Parrish could not attend because he was currently deployed on a mission from the Navy. Finally, Chair of the Minnesota Republican Party Keith Downey gave his spiel. I’m surprised that many weren’t lifelong politicians, but instead related to the political system in some way or another. My thought is that more people are running from different backgrounds for office since President Trump has been elected. After speeches were over, District 58 broke into two sub-districts, 58A and 58B. Cannon Falls was in 58B, and we then went on to nominate our House Representative, Pat Garofalo, who has been the incumbent since 2005. We then selected Delegates to the State Convention. 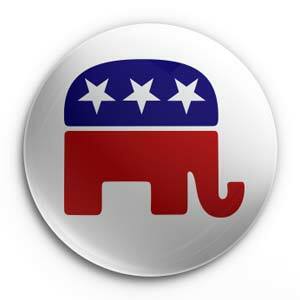 The Republican State Convention is in Duluth this year, and I was selected to be a Delegate. There I got to vote on Party Platform and help nominate a candidate for Governor. Political participation is vital, as it always is. Republicans have a bad habit of mobilizing, getting change in office, becoming complacent, and then losing the next general election. Minnesota almost gave its electoral votes to Trump; it was only three percentage points off. A big theme at the Caucus was “we can turn Minnesota Red”; let’s just hope the electorate has not become complacent.